Glass shower doors are a popular choice for shower enclosures because of their elegance and beauty, giving more of an open appearance to your bathroom’s interior. One of the necessary requirements of having glass, however, is keeping it clean and clear from smudges and buildup. Glass is by nature a porous material and, due to this fact, hard water and other minerals or contaminants can easily penetrate the surface, leading to ugly stains and corrosion. This can eventually result in permanent surface damage that is impossible to restore. Diamon-Fusion, the preferred choice of homeowners, designers and architects around the world, is a patented protective coating for your glass that prevents these harmful elements from doing any damage. It creates an super-thin, invisible barrier that seals these pores and repels stains, dirt and other mineral polutants. The result is a glass that lasts longer, looks better and is easier to maintain. What are the benefits of Diamon-Fusion? With Diamon-Fusion, you’ll save a lot of time on cleaning – by their estimates, up to 90%! Because dirt, oil and mineral deposits from water and soap scum is naturally repelled by the coating, there’s just not much need to constantly clean your glass. This will not only save time but also money for harsh and abrasive cleaning products which are not environmentally friendly. Your shower door will continue to look like new with very little effort on your part. You can simply wipe it off with a micro-fiber towel and water for perfectly clear glass, free of streaks and smudges. Diamon-Fusion is also UV resistant, which means that is won’t fade or break down even with direct sunlight. Does Diamon-Fusion come with a warranty? Diamon-Fusion carries a lifetime warranty on home shower door applications and a 15-year warranty for commercial applications. 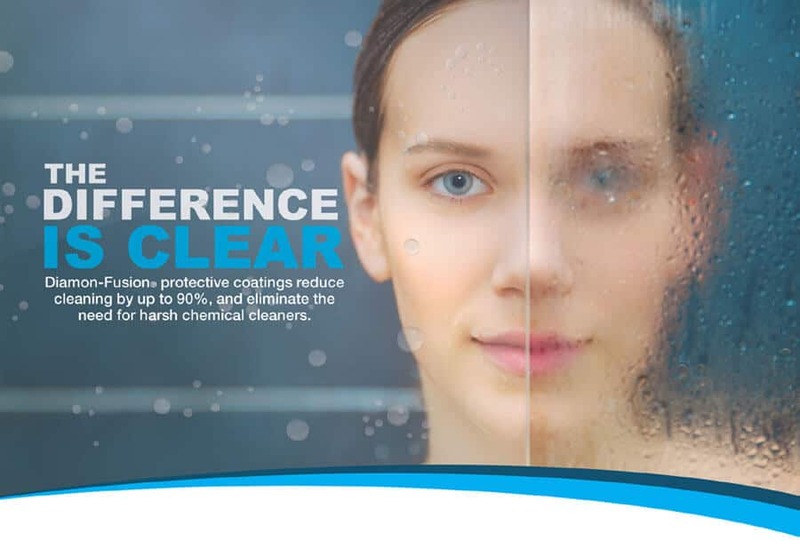 The patented coating is guaranteed to never yellow, chip, haze, crack, peel or discolor. Your new glass shower doors are an investment in your home and, if you’re like most people, you want to maintain their value for as long as possible. Fixing or replacing your glass after just a few short years would be a much more expensive proposition than the preventative measure of protecting it from the beginning. Additionally, when you consider the extra time and money you’ll save with 90% less maintenance, adding the Diamon-Fusion protection makes it a very cost-effective decision that will easily pay for itself over time. If you’re thinking about whether or not to purchase the Diamon-Fusion coating to your new glass shower doors, when you consider the savings, the simplicity, the extra clarity and optical brilliance it brings, the answer sure does look clear! Contact Schicker Luxury Shower Doors to learn more.